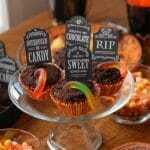 These cupcakes are very simple, delicious and bring a Halloween festivity whenever they are served! A key step with this recipe is frosting each cupcake and dipping it into the cookie crumbs one at a time to allow the ‘dirt’ to adhere to the frosting. Using this link, print the tombstones on the white cardstock. Cut out the tombstones and tape a lollipop stick to the back, ensuring when inserted into the cupcake the paper tombstone sits flush with the top of the cupcake. Place ground cookies crumbs in a small bowl. Frost the cupcakes one by one. When frosted, place the frosted top of the cupcake in the cookie crumbs. Gently turn the cupcake until the top is covered and no frosting is showing. Insert a tombstone in the cupcake. With the chopstick make a hole in a desired location and insert one end of a gummy worm into the hole.